DEAR MAYO CLINIC: My dad was diagnosed with hypertrophic cardiomyopathy at age 52. He has been on medication for a few months, but doctors said he likely will need surgery, even though his symptoms are very mild. Is surgery always necessary for people with hypertrophic cardiomyopathy? Should my siblings and I be tested for the condition? ANSWER: The goal of treatment for hypertrophic cardiomyopathy is to control its symptoms. Surgery can be a useful option for some people, but it’s not always necessary. Because this condition is genetic, it is a good idea for you and your siblings to talk with your doctors about being evaluated for it. Hypertrophic cardiomyopathy is a condition where the heart muscle, called the myocardium, becomes thick. This thickening of the heart is not caused by an underlying condition, such as high blood pressure or heart valve problems. Instead, it is an inherited disease. People are born with hypertrophic cardiomyopathy. Most commonly, the heart muscle thickens during the teenage years. However, symptoms of the disease can appear later in life. Many people with hypertrophic cardiomyopathy don’t know they have it, and the disease may not cause any symptoms. When it does, the most common symptom is shortness of breath during activity. It also may cause fatigue, fainting and chest pain. These symptoms often happen when blood has difficulty getting out of the heart due to the thickened muscle. The medical term for this is obstruction. As the heart muscle thickens, it can become stiff, and that also may lead to symptoms. Because the heart muscle is abnormal, the electrical system of the heart can be affected, causing abnormal heart rhythms, or arrhythmias. This can lead to a sensation of fluttering, rapid or irregular heartbeats. People with hypertrophic cardiomyopathy also may have an increased risk for sudden death related to the heart. Heart testing can help doctors better define that risk. When hypertrophic cardiomyopathy causes symptoms, the first line of treatment, as in your father’s situation, is usually medication. Medications may be used to relax the heart muscle and to slow the heart rate, so that the heart can pump more efficiently. The most common drugs used for hypertrophic cardiomyopathy include beta blockers and calcium channel blockers. If medication isn’t enough to keep symptoms in check, then a surgical procedure may be appropriate. A procedure called a septal myectomy is considered the gold standard for treating this disease. It involves removing the portion of the thickened heart muscle that is obstructing blood flow. That allows blood to flow more freely through the heart. For most people, symptoms of hypertrophic cardiomyopathy significantly improve after this surgery, with long-lasting results. 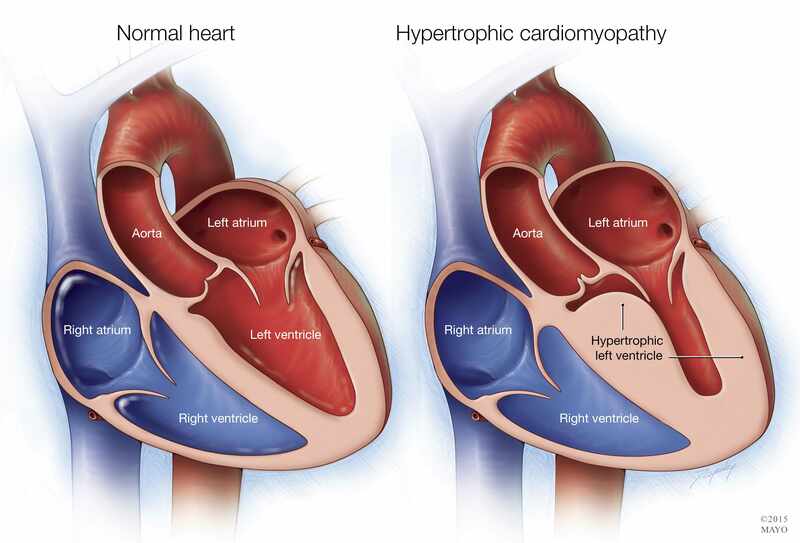 Because hypertrophic cardiomyopathy is a genetic condition, it can be inherited. The genetics involved in hypertrophic cardiomyopathy are complicated, and, many times, an evaluation by a genetic counselor is appropriate. Everyone who has hypertrophic cardiomyopathy should encourage his or her parents, siblings and children to be screened for the disease.